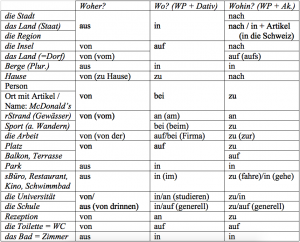 I admit, the German language is quite complex regarding its many prepositions with different uses depending on the questions woher, wo or wohin. In this post, I’m going to offer you a table with the most common places as well as some rules. When we come from a place, we use von or aus. The difference between these two prepositions is the following: We use aus when we come from inside a place, this includes countries and cities (because you have been inside them). Von means we are coming from being near a place, or from a flat place like a square (see point II.2.). When we say where we go (to), we also have 2 main prepositions: nach and zu. The general rule is we use nach with places without articles (countries, cities, islands, regions) and zu for places with article (die Post/der Arzt) as well as people (Sarah) and places with concrete names (McDonald’s, Zara…). The only exception is the term Hause: We say ich gehe nach Hause (to go home) but ich bin zu Hause (to be [at] home). Woher kommst du? – Ich komme aus Österreich/Lissabon/Andalusien. Wo bist du? – Ich bin in Schweden/Helsinki/Kalabrien. Wohin fährst du? – Ich fahre nach Liechtenstein/Hamburg/Sibirien. Like in English, in German we consider to be on (auf) a flat place or open space such as: der Platz, der Balkon, die Terrasse, das Land/Feld/Dorf (the same concept applies for islands) and also the toilet is a place we sit on! Woher kommst du? – Ich komme vom Barbarossaplatz/Balkon/der Terrasse/Toilette. Wo bist du? – Ich bin auf dem Platz/Balkon/der Toilette/Arbeit. Wohin fährst du? – Ich fahre zum Alexanderplatz/gehe auf die Toilette/den Balkon. We have special prepositions expressing that you are in/at → bei, or go to someone’s place → zu. It may be a simple given name (Hanna) or a profession (Frisör). Woher kommst du? – Ich komme von Hanna/vom Frisör/Arzt. Wo bist du? – Ich bin bei Hanna/beim Frisör/Arzt. 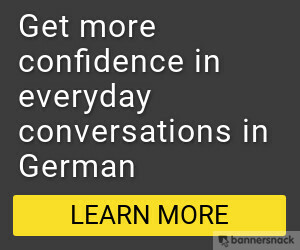 Wohin fährst du? – Ich fahre zu Hanna/zum Frisör/Arzt. 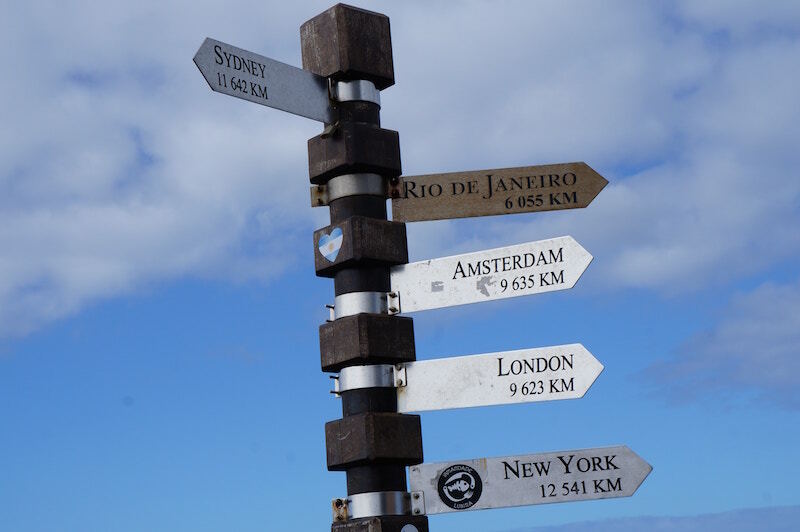 In German, we distinguish between going to (direction) or being near a place (e.g. when I meet someone at the door, or there’s a busstop…) → zu. The other aspect is entering or being inside a place (e.g. when I meet someone inside, or I want to buy something) → in. When we come from near a place → von, when we get out of the inside → aus. Woher kommst du? – Ich komme aus dem Krankenhaus/aus der Post. (I’ve been inside.) / Ich komme vom Krankenhaus/von der Post. Wo bist du? – Ich bin im Krankenhaus/in (or: bei) der Post (I am inside). / Ich bin am Krankenhause/an der Post (very near/next to the post office). Wohin gehst du? – Ich gehe zur Post (direction). / Ich gehe in die Post (I go inside because want to buy/send something). Wohin gehst du? – Ich gehe zum Strand (direction). / Ich gehe an den Strand (= I’m planning to stay on the beach). For more detailed examples click here.